The CWmodular website is an invaluable resource for the SonicCore modular user. It lists all the modules available for Mod 2 & 3 in far more detail than is available here and also features a very useful collection of links to other resources. All of the CWmodular modules can be downloaded here, and read about here. There are currently 138 modules available. A full module listing can be found at the bottom of the page. Long delay, with insert points, gain and High Pass filter. Up to three inputs build a feedback loop. Chorus Module with Rate Modulation input. Same as above, but with "delay" audio inputs (connect the output of any stereo source here); the "In" output is connected through, its level is controled by the "dry" fader. Same as standard Creamware module, but takes up 1/3 of the room on screen AND displays the Attack and Display times. Band pass EQ with very steep attenuation slope. High pass EQ with very steep attenuation slope. Low pass EQ with very steep attenuation slope. 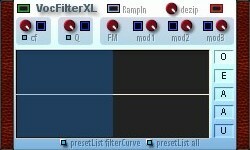 Standard Vocal Filter, but crossfades between formants can be controlled over time by an editCurve display. You can just draw the curve in with a mouse. Various mod inputs to control frequency and resonance. Editable dezip (left=none, right= max). Seperate preset lists for the vowel curve and for the whole module. Crossfade between Low and High Pass filter with freq and xfade modulation. Converts a Gate signal to a Trigger. As above, but can handle bipolar threshold values. Outputs a given value on GateOn signal. Multi LFO with modulation input on all controls. Combination of standard midiClock, clockDivider and freqDivider modules. Add signal 1 to signal 2. Value meters which show values in the formats -64/+63 as well as -1.000/+1.000. Value meter which can be switched between UniPolar and BiPolar modes. Value meter which show values in the ranges 0 to 127, 0.0000 to 1.0000, 0 to 2147483647. Binary value meter which shows values in the ranges 0 to 127, 0.0000 to 1.0000,-2147483648 to 2147483647. 8 Channel micro mixer - 8 mono ins to Stereo out. 4 way mixer - 4 ins, one out. Text labels for each input. A multiplier with extreme exp curves. A full wave rectifier. Takes an input signal and makes its polarity wholly positive. See here for an explanation of Full Wave Rectification. Seperates the Positive and Negative elements of a signal to different outputs. Cross fade between any two input values in the 'Integer range' (between -2147483648 and 2147483648). The little button on the Right Hand Side is used to switch between text input and pad input. Switch one input between two outputs. Switch one output between any one of 16 inputs. 4 way switch with text labels for input and all four outputs. Switch one output between two inputs. 4 way switch with text labels for output and all four inputs. A threshold switch where the input source is switched to one of the four outs. As an example, if you want to switch an audio source automatically to one of four fx modules, connect audio source to "in", three constVal modules to "thr1-3", and a lfo or MVCvel or whatever you like to "Swi". Connect "out 1-4" to different fx modules. The above is only true for an ideal setup where thr1<thr2<thr3<thr4. If the threshold values are not in a row like above, things are going off-key, and the result will be rather unpredictable. As above, but with textfaders for the thresholds (button:"int"[=intern]). Threshold switch. If value is below the threshold set, input 1 is sent to output, otherwise input 2 is sent. Allow signal though if signal is between the two user specified values. Signals within the range determined by the min and max values are output to the 'withinRange' output, the rest through the 'outsideRange' output. Specify a condition using the upper two fields, and an output value depending on the success or failure of the condition in the lower two. IF Module with condition value modulation and PSwitch input. Monophonic. If the input value is within the specified range, it will be given the new value. Constant Value modules, with and without text areas. Universal Constant Value module (ie, it displays value in three formats: 0 to 127, 0.0000 to 1.0000, 0 to 2147483647 which may be useful depending on the type of signal that is being modified. Bipolar Universal Constant Value module (ie, it displays value in three formats: 0 to 127, 0.0000 to 1.0000, -2147483648 to 2147483647 which may be useful depending on the type of signal that is being modified. Convert a signal from asynchronous to synchronous. Convert a signal from synchronous to asynchronous. Logic module with three different FlipFlop modes, with its own help window. Divide signal 1 by signal 2 (asynchronous). Multiply signal 1 by signal 2 (asynchronous). Multiply signal 1 by signal 2 (synchronous). Switches between input 1 and 2 depending on whether a signal is present at 'sel' input. Mux is a common abbreviation for Multiplexer. Subtract signal 2 from signal 1. Divide signal 1 by signal 2 (synchronous). Outputs a random value signal between a user defined range (allowable values 0-127, with an offset factor), triggered by signals which are between a user defined threshold level. As above, but sends out two independently defined random values. As randVal iR, but with Random values in a bipolar range. Sample and Hold module. Input value sent to output when trigger is received at trigger input. Sample and Hold module. Input 1 value sent to output when input 2 gets a new value. If Input 1 >0, it will be passed to the output. If input 2 is 0 then the last output value will be held. Similar to Creamware's stock FmOperator, with sync input (switchable) and gainMod input for EG, lfo or contrSeq modules. If no inputs are connected, control manually by switching 'pot' on. Also allows for feedback to self. An all-in-one-FM osc with 2 inbuilt AD EGs and smooth and attenuator faders. Sample Drum Oscillator with built in AHD envelope and velocity sensitivity controls. Mini Sine Oscillator with Coarse and Fine tuning options. Mini Sine Oscillator with pitch modulation and PM intensity controls. Mini Sine Oscillator with pitch modulation and PM intensity inputs. Mini Sample Oscillator with built in AHD envelope. All-in-one solution to sync creamware, adern and cwm seq modules, and LFOs/AdernRamp. Two ramp LFOs included. Sync module with 4 gateDividers, 4 freqDividers, 4 ramp outputs. ramp dividers in range 1/16 to 8. (async) gate modules' reset input can be connected directly. no need to use gateOR module. button to select internal or external trigger signal (via start/stop button or MVC gate out). tempo modulation input - use values between 30 and 250. Text module, same design as CWMorph modules. Various different colour text modules to label parts of your patches. Each module has four arrows which you can highlight to indicate which section of the patch it is for. The CWMorph modules allow you to morph between any number of different patch parameters at the push of a button. The basic concepts are explained here. There are a number of patches available to give you an idea of what's possible. See here, here and here. The LFO, filter and Mix modules are just copies of the stock Creamware modules, but with no controls - these have to be controlled by a ControlUnit module. Same as above, but extended version with phase, fade, delay, and waveform mod inputs. This module is more suitable for fast rate modulation. This is one of the main CWMorph control units. Connect the square outputs to the mod inputs of the modules that you wish to morph. The bottom knob sets the amount that you want to send as your initial morph state, the next knob up sets the amount of time that it will take to morph to that new value, the top knob shows the current value being sent. Connect the Morph Switch or MorphSwitch Mod modules to control the Morphing from one state to another. As above, but with faders instead of knobs - for connection to the CwMorph Mix4 module. A Control Unit CU where the "startVal" can't be controlled, made for external inputs. The pots nevertheless show the actual input values. Always in bipolar mode. Switch between the various Morph states in the Morph Control Unit. As above, but with Modulation input, so the switching can be controlled by the Morph Time Control module. Connect to the MorphSwitch Mod to program a timeD sequence of Morph state changes.